Paris is a majestic city, a city of culture, romance, gastronomy, design and fashion. It is also a city on the move ..with new museums, world-class sporting events and festive happenings all around the year ! Whether you come for the first time or you already are familar with Paris, there is a vast choice awaiting for you : over 1800 classified monuments, 170 museums, 145 theaters .... Some of the the cultural sites of the capital are absolute 'musts' and among the most visited monuments in the world. However, Paris is not just a historical city. The riverbanks of Seine and some neighbourhoods with village atmosphere, are an invitation to stroll and sightsee. By day or by night, from Le Marais to Belleville, from Montmartre to Champs Elysees, from Saint-Germain-des-Pres to Cours St Emilion ... enjoy the special ambience of these Quartiers and the true spirit of the city. Let yourself be carried away by its energy and vitality. There are also a very large amount of green parks of different size in Paris. 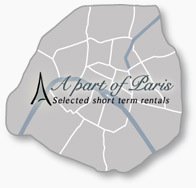 Place des Vosges, Tuileries Gardens, Luxembourg Gardens, Champs de Mars, Butte Chaumont are some of the large ones. These areas are wonderful to make a break during a busy day in Paris.